Scarlets coach Wayne Pivac says "horrific stats" hurt his side's efforts as they squandered a 32-18 lead over Ulster in their Pro12 opener at Parc y Scarlets. He also says his players did not follow instructions after they went into that 14-point lead. 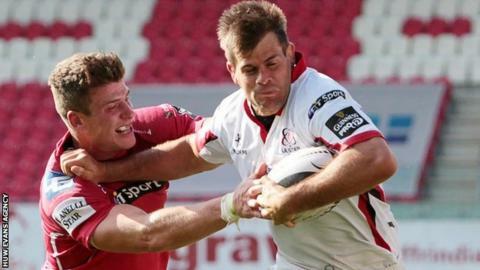 And he says the failure to "control our emotions on the field" also helped Ulster to fight back for a 32-32 draw. The New Zealander was in charge of his first competitive game for the region. He added: "A lot of errors in that first half - we turned over possession just over 60% of the time we had the ball so that's just a horrific stat." Even after that "rather frustrating" opening period the hosts were 24-15 ahead with Harry Robinson, Rory Pitman and Gareth Davies touching down. A second try from Wales scrum-half Davies helped Scarlets go into the 14-point lead, but Pivac says that is the point at which coaching instructions were not followed. He also felt Wales full-back Liam Williams' sending off late on for a second sin-bin offence was not the cause of their downfall. Williams pushed Paul Marshall at the base of an attacking Ulster ruck when the scrum-half was not in possession of the ball. "I have to have a look at the video on that one, but clearly the referee thought that it was close to that try-line," said Pivac. "We did create some good tries and I think we'll continue to do that. That's the type of team we are." "And every time it's close like that, you run the risk and he (Williams) paid the price. But it was more around prior to that, around 32-18 I think the game should have been won. "We received the kick-off and spread it across our goalposts. "That wasn't the intention - it certainly wasn't the message that was sent out. So those are the things. We've got to control our emotions on the field. "And those are the things that we'll be working on pulling this tape apart as a team, to ensure we learn from that performance and are better next week (Saturday, 14:40 BST at Leinster)." Pivac was also unhappy at the missed tackles he felt allowed Ulster to score "soft tries" which countered Scarlets' ability to create "great tries". "Ulster are a good side, but it was more the gifting of points that was frustrating for me, rather than they created some great tries," said Simon Easterby's successor. "On the other hand I thought we did create some good tries and I think we'll continue to do that. That's the type of team we are."